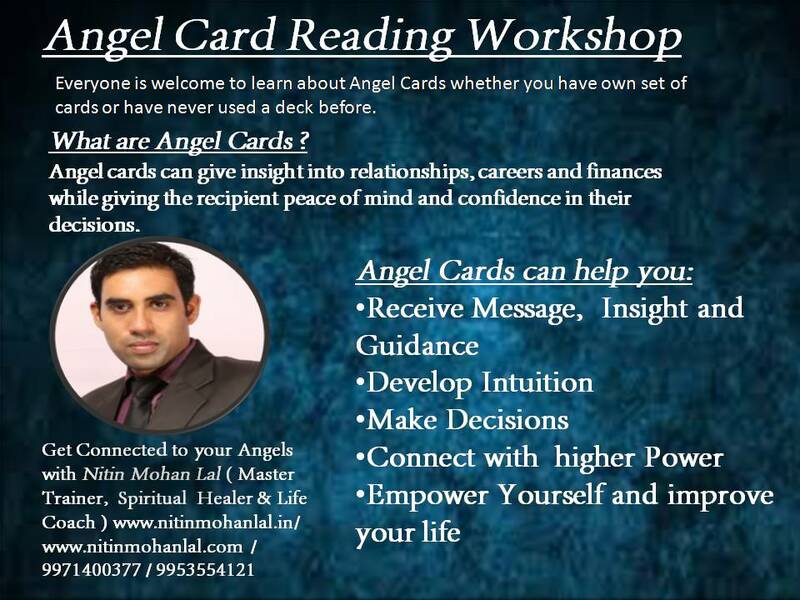 GET CONNECTED TO YOUR ANGELS THROUGH ANGEL CARD READING WITH NITIN MOHAN LAL BEST WAY TO COMMUNICATE WITH THE ANGEL IS ANGEL CARD READING This workshop empowers you to connect with your Angels through Angel cards for getting their messages about career, relationship, finance, health and other desires for yourself as well as other people. The course details : Introduction to Angel Cards Why use Angel Cards Difference between Tarot Cards and Angel Cards Connection with Guardian Angels / Archangels / Spiritual Guides & Ascended Masters How It works Healing with Angel Decks The Deck and it’s structure Detail knowledge of cards and it’s interpretation. Meditation with the cards Everyday Spreads to take the guidance from Angels Live Practices Enhance consciousness Date : Once in a month Timings: 10 a.m. to 5 p.m. Energy Exchange : Rs. 5000 including Certificate, Oracle Decks, crystal for protection, Angel Pouch and Angel Cloth, Lunch, Manual & Angel Blessings. Venue : RUUHAN : The Spiritual Training and Healing Center, B – 119 Ground Floor, Parsvanath Paradise, Mohan Nagar, Ghaziabad near Vaishali Metro Station About Facilitator Nitin Mohan Lal is a Reiki Grand Master and done so many spiritual healing courses. He has been practicing Reiki and other spiritual modalities since long and molded life of many people by his simple and true guidance. It was Nitin's curious instinct, humane temperament and intuitive bent of mind, which today, makes him 'What he Is' - an Alternative Therapy expert and trainer specializing in diverse techniques ranging from Tarot Reading, Angel Reading, Reiki, Kundalini Reiki, Switchword, Numerology, Gratitude, Past Life Regression, Pranic Healing, Crystal Therapy, Color Therapy, Chakra Healing, Pyramid Therapy, Aura Reading, Dowsing. He has done Masters in Business Administration in the field of Human Resource & Personal Administration and Masters in Industrial Psychology. He has worked with Japanese Multinational Company for 15 years. He is a blessed channel of light. His knowledge & interest in metaphysics enriches his beingness. He does personal healing sessions, along with conducting workshops on a regular basis. He has worked with thousands of people to bring balance and healing to their lives through one-on-one sessions, group presentations, workshops, distance healing and telephone consultations. His uplifting and empowering presentation style is light-hearted and joyful, and makes transforming your life easy and fun.